The Cassini spacecraft had already found evidence that the tiny icy moon has a subsurface ocean or sea beneath the surface ice crust, which feeds the huge geysers of water vapor erupting through cracks in the surface at the south pole. The new findings suggest that this subsurface body of water is similar to Earth’s oceans in other ways as well, with hot hydrothermal vents on the rocky bottom of the ocean. Cassini has flown directly through the plumes, sampling them as it did so. The discovery of water vapor, salts, and organics all pointed to a salty ocean similar to those on Earth. 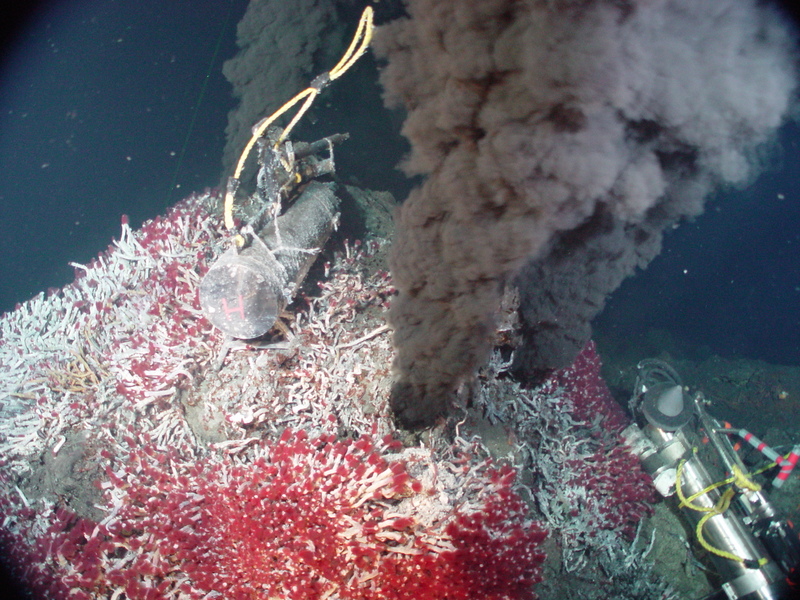 The data also implied that the water was in direct contact with the rocky bottom, as on Earth, which meant that hydrothermal vents might be possible, making nutrients available to any putative life forms. 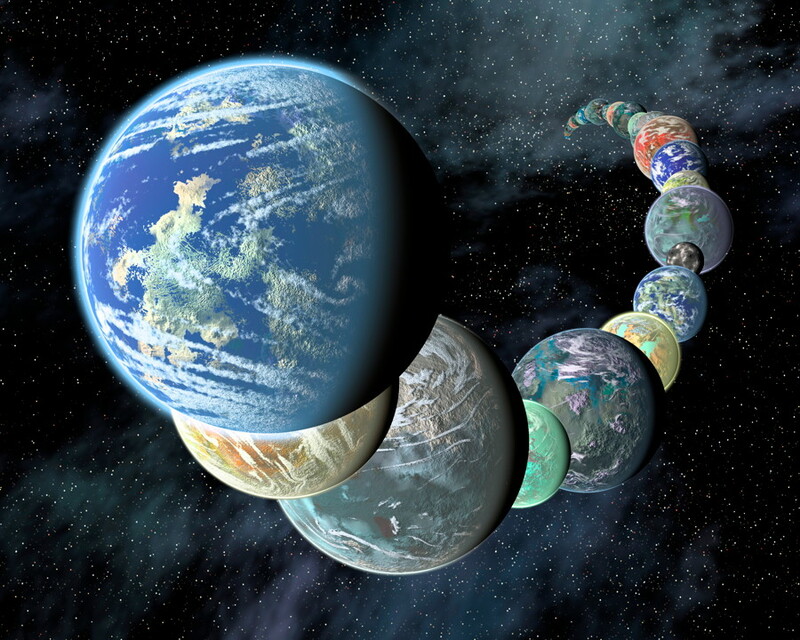 The new evidence supports that theory; the presence of heat, organics, nutrients, and water increase further the possibility of life of some kind being able to exist in this alien, yet familiar, environment. On Earth, seawater infiltrates and reacts with the rocky crust, becoming a heated, mineral-laden solution which is released through the vents. They can be localized oases in the otherwise dark and cold ocean bottom, supporting a wide variety of life. Scientists were able to make the discovery by studying tiny microscopic grains of rock found in the plumes found by Cassini’s Cosmic Dust Analyzer (CDA) instrument. They determined that the grains, composed of silica, most likely formed when hot water in Enceladus’ interior moves upward, coming into contact with cooler water. Temperatures of at least 194 degrees Fahrenheit (90 degrees Celsius) would be required. Their extremely small size, 6 to 9 nanometers, pointed to a hydrothermal origin. On Earth, the most common way for silica grains of this size to form is by hydrothermal activity under a specific range of conditions: slightly alkaline and salty water which is super-saturated with silica and then undergoes a big drop in temperature. These findings were just published this week in the first of two papers, in the journal Nature. The tiny size of the grains also means that they travel from the hydrothermal vents deep below up to the near-surface, about 30 miles (50 kilometers), fairly quickly; otherwise, they would be much larger. 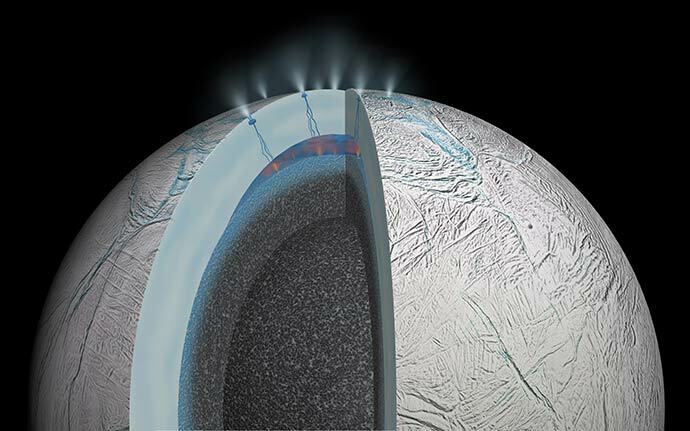 The vents may be widespread on Enceladus’ ocean bottom, since other gravity measurements by Cassini indicate that the moon’s rocky core is very porous, which would allow ocean water to percolate into the interior, a relatively huge surface area. The team’s experiments were also validated by another Japanese team of researchers at the University of Tokyo, led by Yasuhito Sekine, who worked closely with the American researchers. 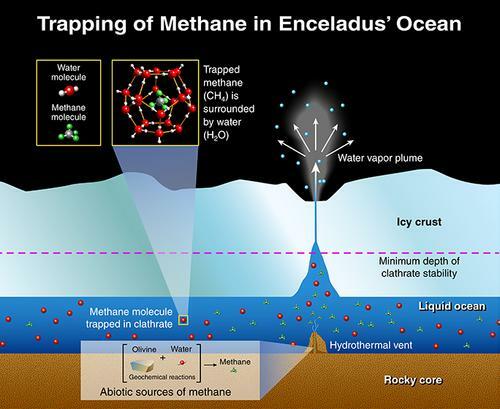 Hydrothermal vents would also help explain another anomaly: methane detected in the water vapor plumes. These results were recently published in the second paper, in the journal Geophysical Research Letters. Studies done by the team found that icy clathrates should form due to high pressures in the ocean; these clathrates might trap methane molecules. But the studies also showed that this process would be very efficient at depleting the ocean of methane. So why is methane still so abundant in the plumes? Two scenarios have been suggested. In one, the ocean is super-saturated with methane, which could mean the methane is being produced faster than it is converted into clathrates. In the other scenario, the methane clathrates are actually dragged along into the plumes, releasing methane as they rise to the surface. The effect would be similar to bubbles rising in a bottle of opened champagne. In these models, the methane is assumed to be formed abiotically from olivine and water rather than from life. It might be premature though to say that none of the methane could be produced by organisms living in this alien ocean; we simply don’t know. 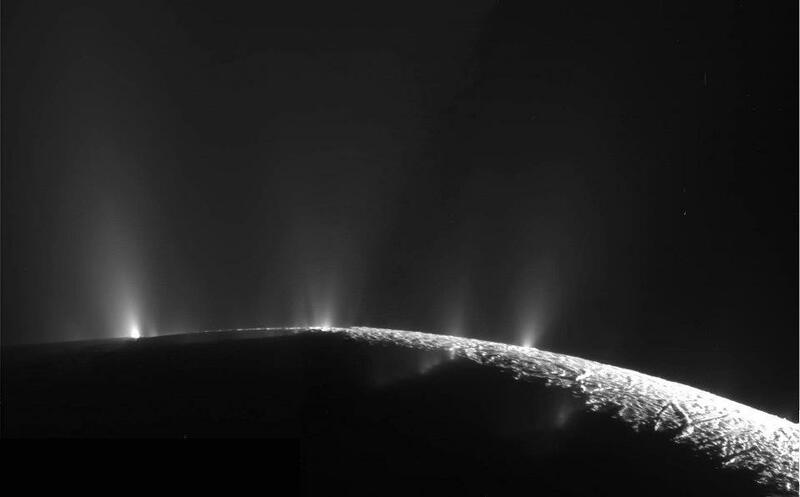 Ever since the initial discovery of the water geysers by Cassini and the evidence for a subsurface ocean, Enceladus has become a primary astrobiological target in the search for life elsewhere in the Solar System. Along with Europa, it tops the list of those places where future missions can do just that, which are being planned now. Carolyn Porco, a planetary scientist with the Cassini mission, and other researchers have just submitted a proposal to NASA to fly an Enceladus Life Finder mission, a spacecraft that would hunt for chemical signatures of life in the Enceladus plumes.